Flagstaff Open Studios Tour this Weekend! If you are going to be in the Flagstaff area this weekend, please stop by to see me at this year’s Flagstaff Open Studios Tour! I have tie-dye and batik items in my inventory, as well as my Fiber Art pieces . I hope to see you there! Cinde took this shot of me next to my framed fiber art piece "North of Taos, N.M.". Here is Cinde, next to her beautiful Beaded necklace and earring set, and she is wearing the piece she made for last year's Prelude exhibit. There was a large crowd there by the time we arrived and it stayed crowded for the next couple of hours... if you're in the Flagstaff area during August or early September, try to stop by. It's at 2300 North Fort Valley Road. You can get more info at culturalpartners.org. 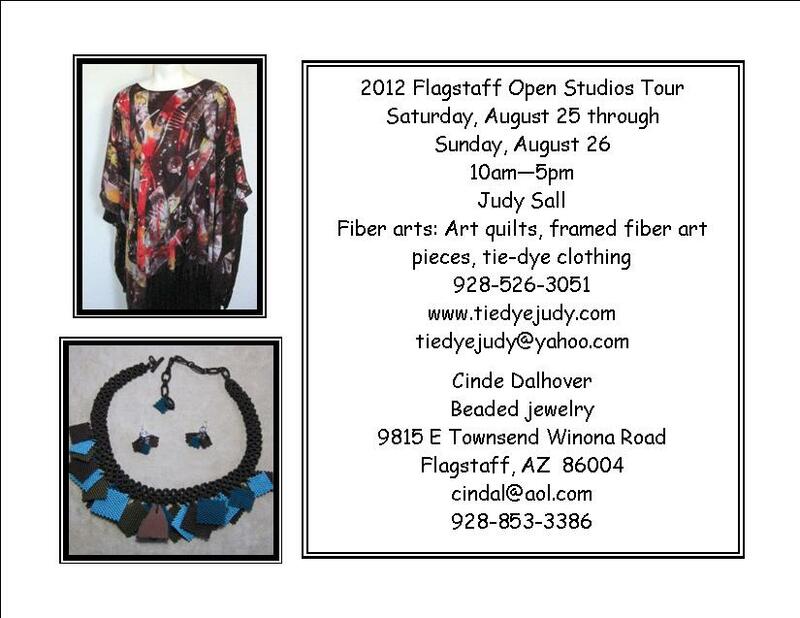 And if you're in the area August 25-26, Cinde and I will be at studio #41, 9815 E Townsend Winona Rd. Hope to see you there! I am thrilled to announce that I have been invited to be a Resident Artist blogger on "...And Then We Set It On Fire", a Technique Driven blog dedicated to mastery of Surface Design techniques! I have been following this blog for some time now, and really appreciate the opportunity to participate with the other fiber artists in the group to learn and share. If you have followed my blog at all over the past 5 years, you know I love to try new things, and over the past 3 years I have been slowly learning how to teach the techniques to others as well. I look forward to continuing on this path as the newest member of this group!